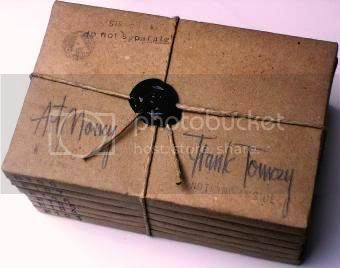 Art Money is an original art object by which we aim to create a global alternative currency. To offer artists worldwide the chance of financial freedom and worldwide exposure in order to focus on the creative process in the pursuit of a beautyfull world. To integrate an alternative global currency with local currencies world wide as a setp towards equal shopping conditions for rich and poor reguardless of the conditions of the local social environment in the persuit of a world of individual choise and personal freedom. To create an art object with a pratical social application. Using art money to pay for private accomodation will bring people together in an intimate private situation. This may offer the chance for new friendships among strangers from all over the world. This currency may as such function as a human link across cultural, racial, linguistic, political and religious barriers in the pursuit of a peacefull world. 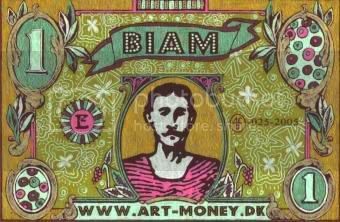 Art money is created by artist’s registered in BIAM. Each artist can issue an amount equivalent to the value of own art production. Art money is flat and measures 12x18 cm. All durable materials can be used. 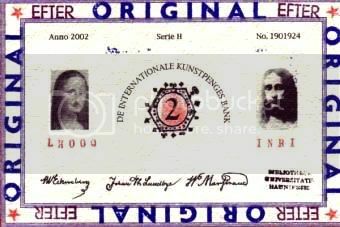 The bill shows serial number, year of production, http://www.art-money.org/, artist readable name, artist original signature. Art money must be an original work of art and show a visible sign of the artist’s physical work. Art money starts at a value of 20 Euro and increases by 5 Euro per year for 7 years. It holds the value of 50 Euro after 7 years. Art money is guaranteed to buy art and services at registered BIAM artists for up to 50% of purchase price. Art money can be used as a means of payment in registered BIAM shops and industry in respect of the individual policy of the business. It may well be used other places where accept is found.